Yikes, it's Friday already, the week has flown and I'm way behind on KCW. But, I have been tracing, cutting and sewing each day so that counts, even though I haven't actually had a finished garment til today! 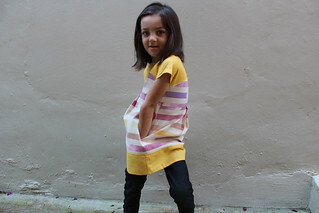 I suggested the Maggie Mae pattern from Shwin&Shwin. I made one for big girl this time last year (see it here) and we love it - it's such a classic little shape and has had so much wear. 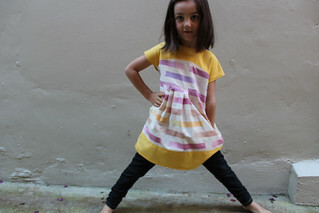 Luckily little girl went for the idea and also my fabric suggestions (cottons from the stash). When I asked her to model the dress for some pics she obligingly gave me these poses :-) This kid kills me sometimes - she can be so cute at times and other times she drives me absolutely bananas!! Next on the list is to finish big girl's parka top. Then I have a few pj's I'd like to make... I think my KCW will be spilling over to next week. And I'm loving seeing all the pics on the Flickr group and the Instagram feed (#kidsclothesweek) - so inspiring!! Love this dress! I think I need to get my hands on that pattern. I'm way behind on my KCW sewing too... I think I'll still be going next month at this rate :-/ The sewing gods seem to be against me this week. Oh, this is so pretty! 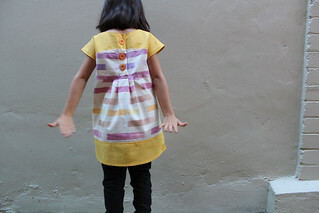 Love the "stash" fabrics she chose and the great buttons on the back. I have this pattern too and made it a few months ago for my 9 yr old. 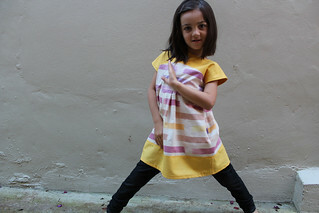 I did find, however, that the neck was quite wide and my daughter hardly wears it as it keeps slipping off her shoulders. Did you have this problem at all or was the fit fine? I love this pattern! Reminds of the Colette Macaron pattern, but I actually think I like the looser fit of this dress better! Nice dress. Look at that modelling, she's a natural!! Love this dress! It looks both really comfy/practical AND super cute. Great fabric choices, too. I love this dress! It is so cute and I love the colors- so perfect! Hi, I'm Jo: designer, crafter, keen cook and SAHM to 3 littlies. I also obsessively sew. Hope you enjoy seeing what I make and what inspires me. Please play nicely and do not use any of my pics without asking or claim my designs as your own. Thanks.